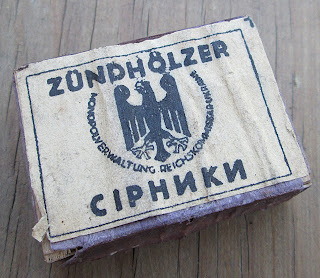 Here is an original wartime box of matches made by "Monopolverwaltung Reichskommisar Ukraine." These matches could have been used on the Eastern Front by soldiers or civilians. They are packaged in a small wooden box covered with purple paper. Two sides of the box have had a coating applied that allows them to be used as a striking surface for the matches. 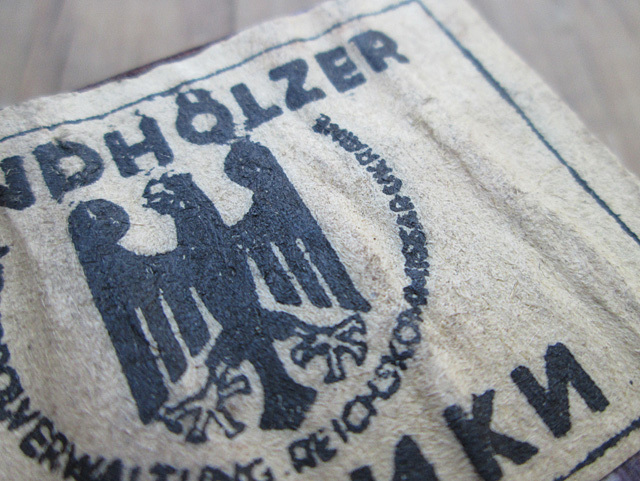 The label for the matchbox is crudely printed on thin, inferior quality wartime paper. The print quality is terrible. The simple graphics and shoddy print quality make this label easy to reproduce from a cleaned-up scan. I printed out a bunch of these reproduction labels and slapped them on some boxes for issue at an event where they were to be used quickly and discarded. I simply bought some small cardboard boxes of matches and covered them with construction paper (I had blue paper on hand), leaving one of the striking surfaces exposed, then added the label. Although the modern boxes are cardboard and not wood, and are not exactly the same size as the original, the result was decent and certainly passable for something to be consumed and thrown away. I have since sourced some purple construction paper that is a better match in color with the thin paper used on the original box. Here is that original box again, together with one of my second-generation boxes (better paper) and one from the original run that was used at the event, got wet and dirty and banged around with the rest of a soldier's personal kit. 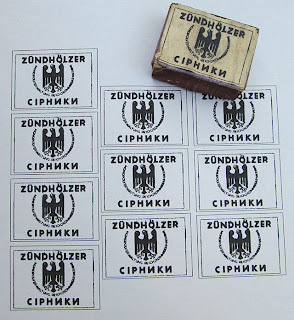 Recipes from a Wehrmacht cookbook - "Improvement of Cold Fare"
What follows is translated from an original cookbook titled "Östliche Speisen nach deutscher Art" (Eastern Dishes in German Style), with recipes tested and compiled by the Oberkommando des Heeres. 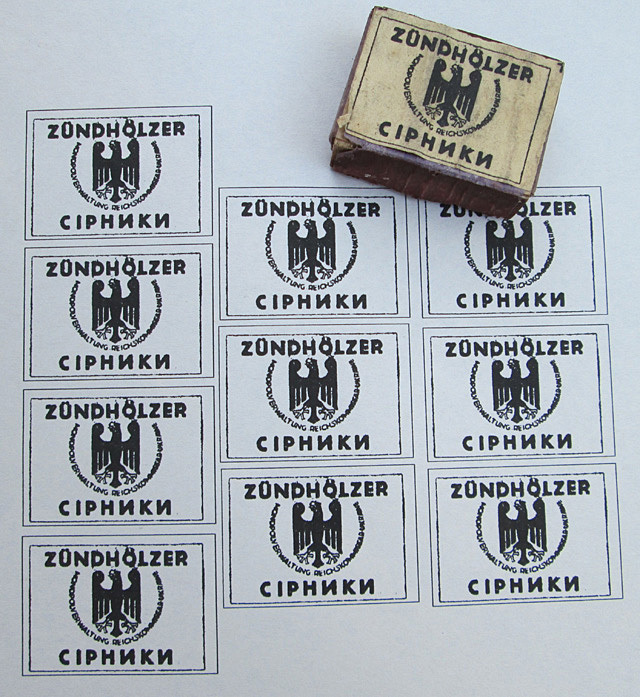 It was published during the war by Alfred H. Linde Verlag in Berlin and was intended to be used as a field cookbook for German soldiers in the East. This section entitled "Improvement of Cold Fare" is particularly interesting and useful for living historians, as it gives insight into some easy ways that German soldiers may have prepared canned meat and other field rations. To stimulate the appetite, and especially during the warm season, cold fare should be flavorfully prepared. The following instructions can be combined with each other to be adapted in various ways. Finely chop the beef and sardines, add the tomato paste and prepare as a pate. Note: If the mixture is too dry, add some butter, margarine or oil. Cut up the meat, gently combine with the tomatoes and onions. Mix with a marinade of the oil, vinegar, salt and pepper. Note: Bell peppers can be used as a substitute for the tomatoes. To make fried meatballs from canned meat, the meat must be finely chopped and then air dried for a time. The meat is then seasoned with salt and pepper and well-mixed with flour. This can also be mixed with bread crumbs, soaked bread, finely chopped onions, egg or only egg white, or egg substitute. Mix everything well together and form into meatballs. Coat with flour or bread crumbs and fry in hot oil until cooked through. For the potato salad, boil the potatoes with the skin on, peel while hot and slice. Immediately mix with a marinade of water and vinegar brought to a boil and seasoned with salt, pepper and finely chopped onions. Pour this over the hot potato slices and either shake or carefully mix until the salad is bound together. Note: The salad can be refined with oil, finely chopped herbs or diced pickles. Canned meat and sausage are paticularly appetizing when fried and roasted together with finely chopped onions and tomatoes. Mix sardines for five potions with 200 g sliced tomatoes. Marinate with the oil from the sardines, 200 g finely chopped onions and lemon juice. Note: If tomato paste is used, it should be mixed in to the marinade. Fry the sardines in their own oil while adding finely chopped onions. Drizzle with lemon juice as a dressing. Fry the sardines and lay them in a pot. Make a marinade from vinegar, onions, salt, pepper, bay leaf and allspice, allow to cool and pour over the sardines. Tuna fish in oil can be prepared just as the canned sardines." Note: For reference, a couple of pictures of original Wehrmacht-issue aluminum food cans. Here are two variations of a can that held fish or perhaps some other kind of meat. The one in front is stamped with a 1944 date code. 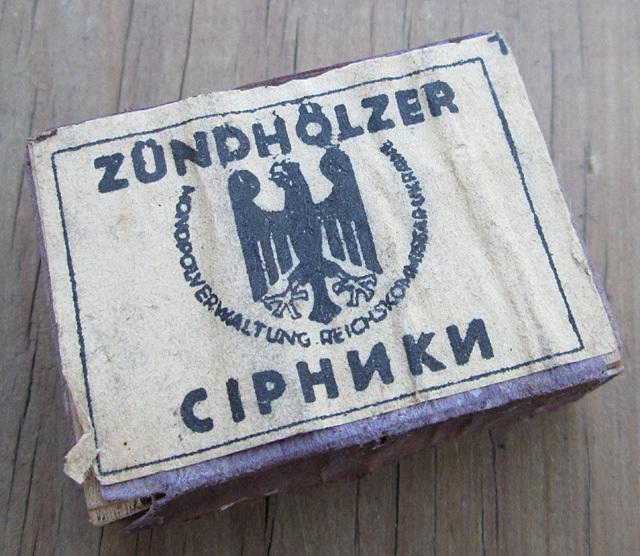 Here is a tin of Norwegian sardines, these are commonly recovered from former German positions. This one was found at Stalingrad. For more information about steel and aluminum food cans issued to Wehrmacht soldiers, check out the fantastic reference "Rations of the German Wehrmacht in WWII" by Jim Pool and Tom Bock. Thanks to Peter Speiser for providing the original cookbook mentioned above.